The number of tourists from Canada to the region was excellent during the summer season, so promotions were stepped up in order to prompt an increase for the 2017-2018 winter season. Canadian wholesaler Sunwing Vacations has named the Riviera Nayarit and Puerto Vallarta as their “Partners of the Month,” which is why both tourism destinations will be part of an intense promotional campaign across their main marketing platforms during the entire month of October. Sunwing Vacations has in the Riviera Nayarit and Puerto Vallarta two partners that sell very well, which is why the included the marketing offices of the Riviera Nayarit Convention and Visitors Bureau (CVB) and the Puerto Vallarta Tourism Trust (Fidetur), along with several of the region’s hotels. The number of incoming tourists from Canada to the area was excellent during the summertime, so promotions are being stepped up in order to prompt an increase for the 2017-2018 Winter season. The promotion will focus mainly on the regions of Victoria and Abbotsford—both in the province of British Columbia—as well as Vancouver, Calgary, Edmonton, Regina, Saskatoon, Winnipeg, Toronto, Ottawa and Montreal, and will use multiple communication channels to ensure sales. It will likewise provide emphasis on educating agents and consumers from the region with privileged information, highlighting some of the local attributes. In the case of the Riviera Nayarit: the Marina Nayarit; an 18-hole golf championship in one of the destination’s six magnificent golf courses; the surfing offer in Sayulita; whale watching; canopy tours and fishing; as well as the Islas Marietas National Park and its marvelous Playa Escondida, an icon of the region. In Puerto Vallarta: a visit to the Malecón (Boardwalk) with its iconic restaurants and shops; entertainment attractions and a look at the nightlife; the church of Our Lady of Guadalupe and the traditional pilgrimages in honor of the virgin that take place every December. 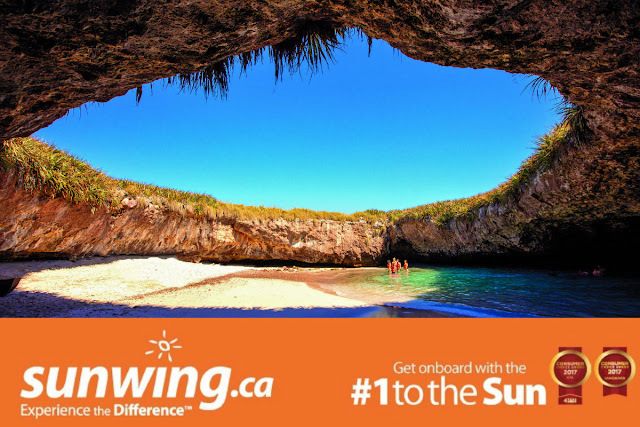 To finalize the full month of promotions, Sunwing will hold a contest for consumers where they will choose 8 people, each with a companion, who will visit Puerto Vallarta and the Riviera Nayarit and experience the attractions of each destination for themselves. With these actions the Puerto Vallarta-Riviera Nayarit region will reinforce its presence in one of the most important markets in North America, according to Marc Murphy, Managing Director of the Riviera Nayarit Convention and Visitors Bureau (CVB). Sunwing Vacations is a wholesaler with a strong presence in this Pacific Region. This is one of the top tourism producers in Canada, where it has built a solid reputation with unequaled service at an affordable price. The Barometer of the Riviera Nayarit CVB indicated 270,232 Canadians arrived in this tourism destination in 2017. Of the total, 28.11% (75, 962) were from British Columbia; 24.32% (65,720) from Alberta; 17.12% (46, 264) from Quebec; 14.17% (38,292) from Ontario; 9.79% (26,456) from Saskatchewan, and 6.49% (17, 538) from Manitoba.